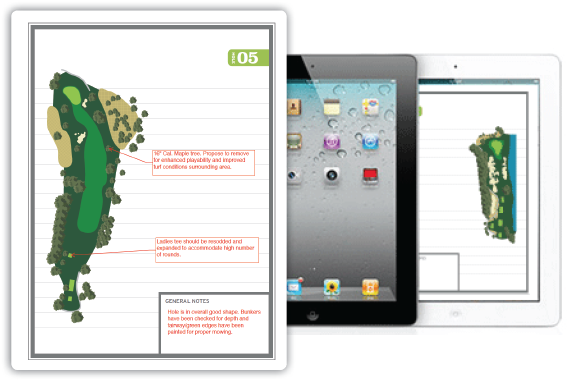 Designed to streamline and error-proof your communications with your crew, these weatherproof or digital field guides will detail every aspect of your course, from irrigation head locations and square footage to course setup and tree ID. You can finally showcase your work to club officials and members in an easy, professional way. Clients rave about how great it is to keep it all updated. And the best part is they come in both hard-copy and digital formats for excellent versatility. The Basics, Done Right & Affordable. - Simple & effective digital mapping tool; affordable for any club. 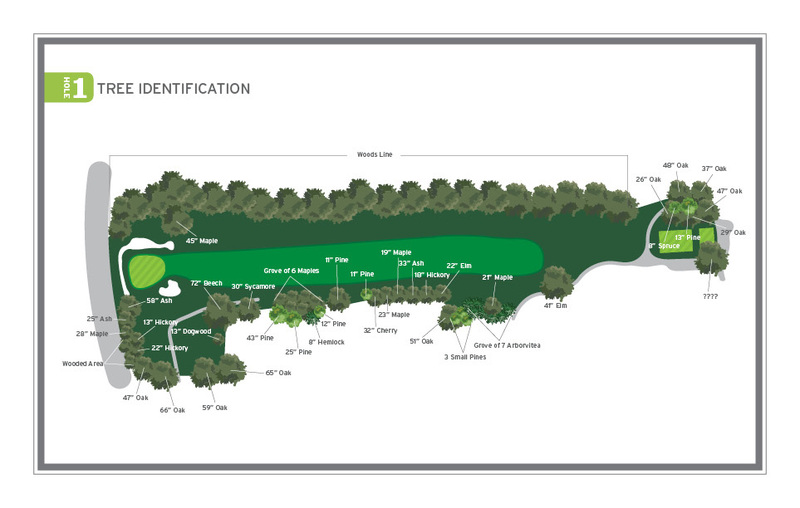 - Includes golf features, tree layer, native areas, and ancillary buildings. 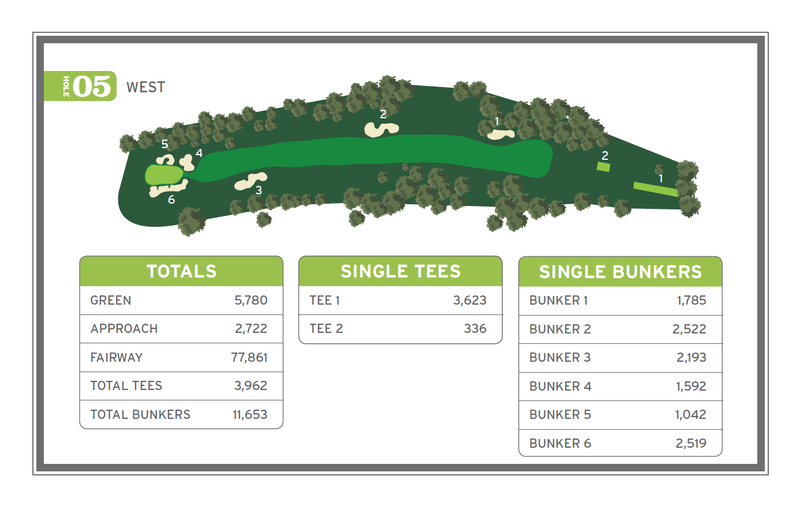 - Pro Shop & Clubhouse can also use for routing maps, placemats. - Ability to create your own layers for irrigation, drainage, projects. - Measure linear & square footage for sod, projects, and more. - Email file to staff or committee with your own notes and job lists. - Print the file for mounting on wall or table to use for directing staff. - Can be used with central irrigation control systems as base mapping. - One-on-one online tutorial for using digital commenting and features. - Custom app provided for phones & tablets. Hole-by-Hole Simplicity in a Great Package. staff, all while away from your office. - Setup includes all holes with tree layer, and complete file for prints. - Print future Notepads on your own, or buy from us at great rate. drawings; measure linear and square footage on each hole. - Can also be used as great visual for interviewing at other clubs. - Option to include iPad as part of package. Best in the Industry and It Works with Central Control. - Clients love our offering, including our flexible payment options. - All irrigation features rendered over hole drawings in multiple formats. - Can use an old printed as-built to convert system, or use digital file. - 3 hard-copy Irrigation Playbooks included for field use. - Very easy and affordable to keep up to date as irrigation system changes. - Available in hole-by-hole, entire property as-built, and satellite cards. - Can be used with central irrigation control as base mapping. - File created in multiple layers to isolate valves, stations, etc. Square Footage & Diagrams Packaged Perfectly. - Set up for easy use in communicating with staff and members. 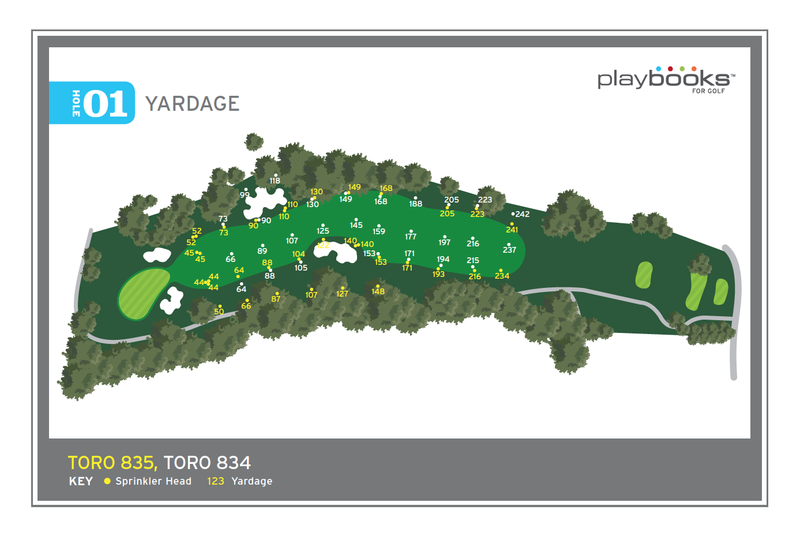 - Includes golf features, tree layer, native areas, and SF charts. - 2 hard-copy Base Maps Playbooks included for field use. - Many clubs order extra books due GM and committee requests. - Print the file for individual hole work lists or notes. - Pro Shop & Clubhouse can also use for playing lessons. - Illustrates species, caliper, and the tree’s relation to the golf features. - It can really help educate members on why a tree must be removed. - Easy to keep up to date when you remove trees, create history. Price subject to location of course and other products ordered. Easily Locate Blowouts, Basins, Electric, Sewers and More. 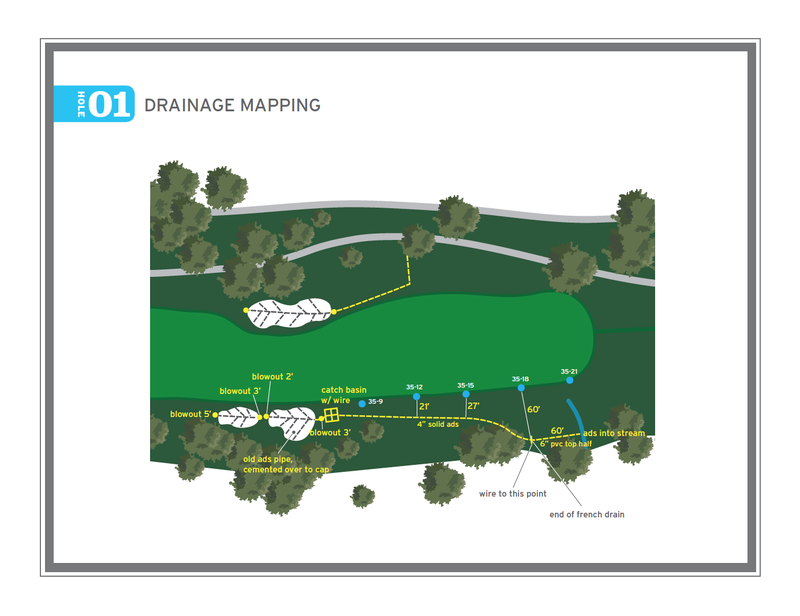 - We map all kinds of drainage and utility features on courses everywhere. - Utlilize the latest in GPS technology for all field work required. - Years of experience means you spend less time with us on the course. - Can also convert hand-drawings or your notes into a digital map. - Files can be combined with existing irrigation mapping if desired. Price subject to scope of work and location. Measurements, Sprinkler Caps & Reference Books. - We provide on-site GPS and laser measurements if requested. - We also offer the best in yardage sprinkler caps at great prices. - We even offer yardage books in a simple and cost effective format. Print them yourself with the provided file. Fully customized and affordable. Flexible Payment is always available. It's easy to keep your maps updated as the course changes at very affordable rates.